We spend lots of time and energy making our homes perfect: choosing paint samples, shopping for furniture, hanging photos. It makes sense—we spend most of our time at home. Right? Many of us may spend just as much, if not more time at the office, and even if that’s not true, sometimes it feels like it is. It makes sense that happier work environments can help us work better. If our desks are our “homes” for the day, why not optimize them for comfort and productivity? Here’s our list of must-haves to help workers make the most of their office space. Not convinced by all the hubbub? The research is there. Sitting all day long has been called “lethal activity,” while the Mayo Clinic’s Dr. James Levine has coined it “sitting disease”. I guess that’s reason enough for lots of people, who’ve made the switch from sitting to standing desks. Unfortunately, most standing desks are expensive. If money’s no object, we recommend one of these. Thankfully, IKEA makes a solid, inexpensive option that’s also gotten great reviews: the Bekant, with adjustable legs. Kickstarter has also helped launch some very interesting and affordable options. Luckily, there’s an option for those who want the option of a standing desk without the commitment. The Ergo Desktop Kangaroo Pro Junior is a crowd-pleaser, and won’t break the bank (too much). 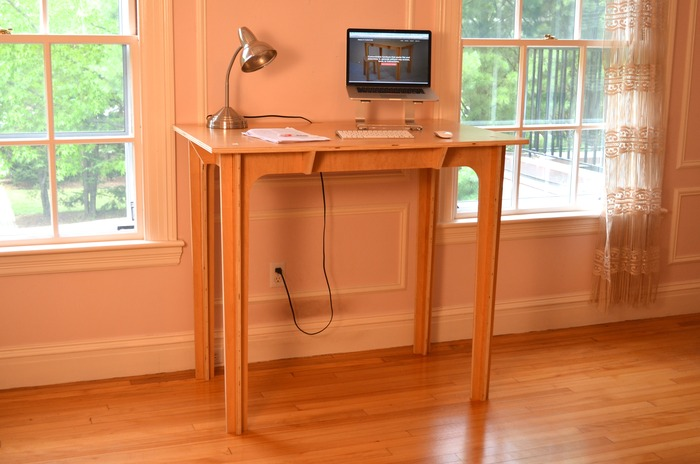 The Stand Desk ($399+) and the Press Fit ($399) both started via Kickstarter and have options starting below $500. If you’re standing all day, you’re going to need a mat. Anti-fatigue mats improve circulation and relieves pressure in your feet, back, and shoulders. Standing desk users swear by the Imprint CumulousPRO. If and when the majority converts to standing desks, most of us will still need a chair. The best chairs are ergonomic, but like standing desks, they’re expensive. If that’s not an issue, we recommend the Aeron or Embody from Herman Miller—both always at the top of every “best of” list. Two great affordable options are the Hon Volt series, available at Amazon, Costco, and others, and the IKEA Markus. One of our remote workers at Highfive uses a high, swivel barstool to complement his standing desk for those times when he needs to give his feet a rest. You’re leaving work at the end of the day with lots of things still up in the air—where to get dinner, what time to meet, etc.—but, lo and behold, you’re phone is out of battery. Make sure this doesn’t happen to your phone and all the other gadgets you need with a portable device charger like the Jackery Giant+. Tired of spilling coffee all over your keyboard, or just a little concerned what’s hiding between those keys? Get this washable keyboard from Logitech. You could waste paper cups or you could keep a water bottle on your desk that will help you stay hydrated during the busiest days. There’s no shortage of great ones out there, but we think the best is the Kleen Kanteen Vacuum Insulated. It truly keeps your liquids cold or hot for hours—and by cold and hot, we actually mean cold and hot, not room temperature. I have three—one in every size. It comes in 12, 16, and 20 ounce sizes, plus lots of colors and lid options. Un-tech yourself with one of these beautiful Moleskine notebooks. A favorite among writers, drafters, and drawers alike, there’s a plethora of options to choose from, and they’re available in most office supply or gift stores. We like the soft covered blank paged books so you can use them for sketching as well. What are your workspace must-haves? Share your ideas in the comments. Photo courtesy of Juhan Sonin.